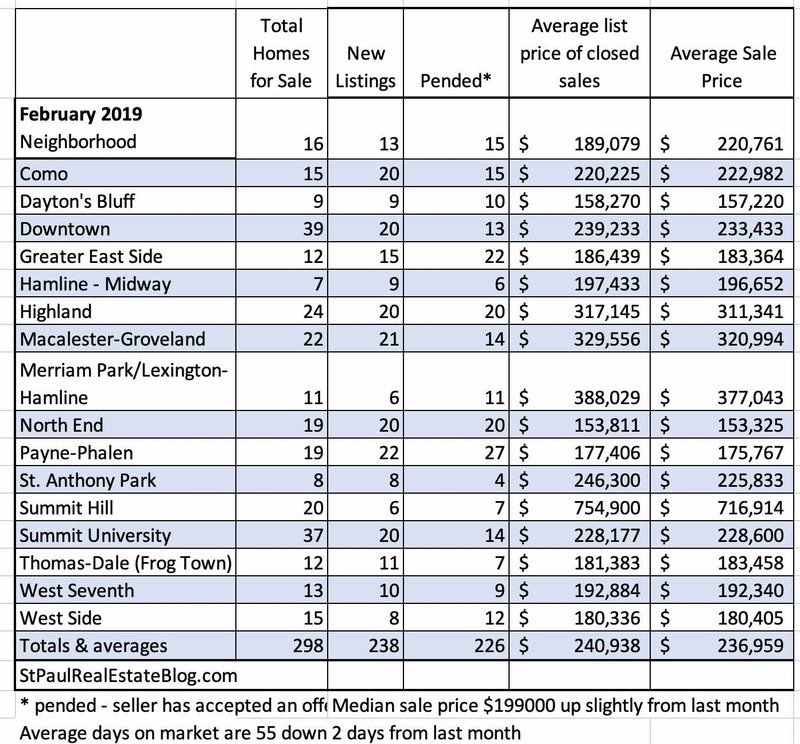 I have numbers for February home sales in St. Paul. I think that is a great way to start the week. The number of homes on the market is decreasing as buyers are snatching them up. The absorption rate went down from 1.8 months in January to 1.7 months in February. The absorption rate last February was 2.3 months which could mean that buyers will face more competition this year. 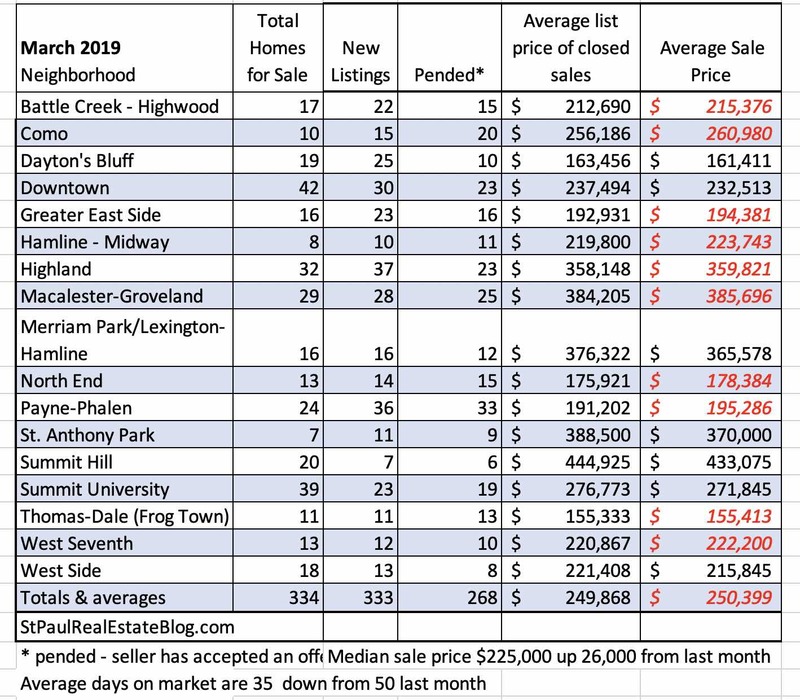 Average sales prices went up less than $200 from the previous month and the time it takes to sell a home went down by two days to an average of 55 cumulative days on market. 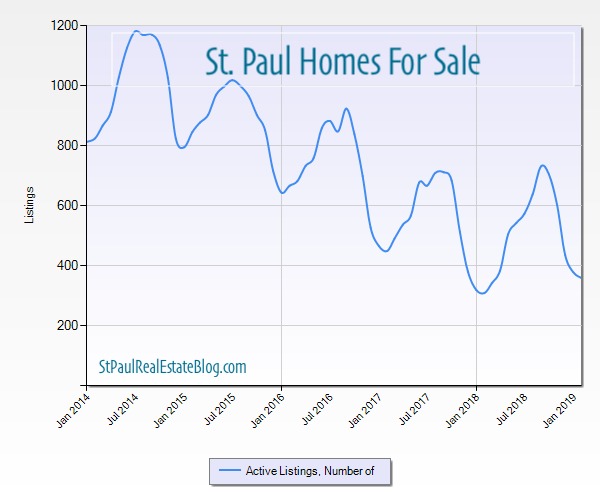 Home sales in St. Paul are influenced by the seasons. We should start seeing more listings as we head into Spring and there will be more buyers out and about too. The data used to make the table was extracted from the NorthstarMLS which is considered reliable but not guaranteed. Once extracted the numbers are gently sorted and subtotaled using a spreadsheet. The data is never shaken, stirred or harmed in any way. I use these charts to show the relationship between how many homes are put on the market and how many are getting offers. 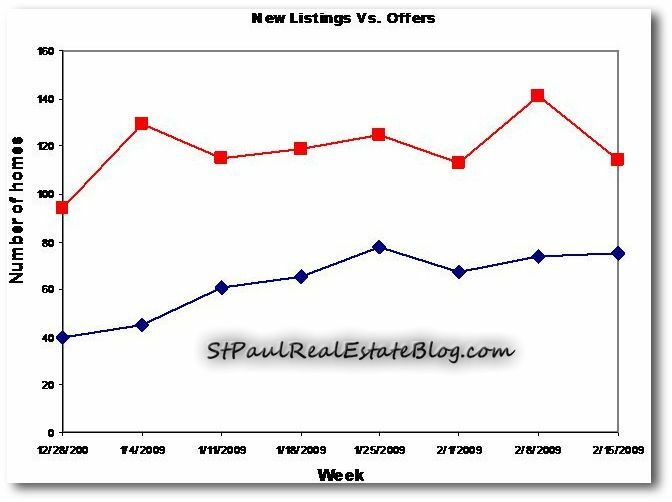 In 2007 the two lines went in opposite directions, more and more homes were put on the market but fewer, and fewer got offers each month. Our local inventory of homes on the market just kept climbing. This chart shows that the lines are both going in the same direction, but there is still more listing activity than there is buying activity. The inventory of homes on the market is much lower than it has been at any time in the last two years. There are currently 1760 homes on the market in St. Paul Last year at this time there were more than twice as many homes on the market. 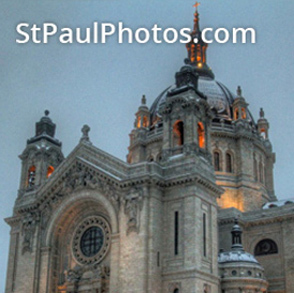 If you bought a house in March of 2009 in St. Paul you paid and an average of $113,306. The house was likely on the market for six months or more. If you bought a house this year in St. Paul you paid an average of $231,363. The house was on the market an average of 22 days. In 2009 it seemed like we could not give a house away. If you bought your home in 2009 it may have already doubled in value. Keeping in mind that average sale prices were $229,625 in early 2006 when local home values peaked. If you bought a house in 2006 it may be worth a similar amount today. In other words, 2009 was a good year to buy a house. For years I have been reading about the “great real estate sell off”. Experts were predicting that starting in the year 2020, which is now less than a year away, baby boomers would start selling their houses. I wouldn’t count on it. The oldest baby boomers will turn 73 this year. 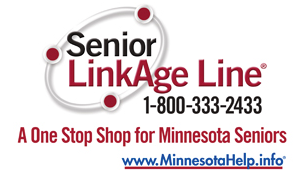 At the same time, the fastest growing segment of the workforce is those who are over 65. There are baby boomers in their 60’s who have their 25 to 35-year-old children living with them and are helping them financially. There were predictions that the great sell-off would result in a glut of houses on the market. Some even opined that real estate values would go down because of the sell-off. I don’t see how that prediction can come true considering how large the Millennial generation is. I am going to go out on a limb and predict that the number of homes put up for sale will rise slowly and that in 2032 we may see a sell-off because those who were born at the beginning of the baby boom and who are still alive today will live another 13 years on average. The oldest Millennials will be 51 by then. 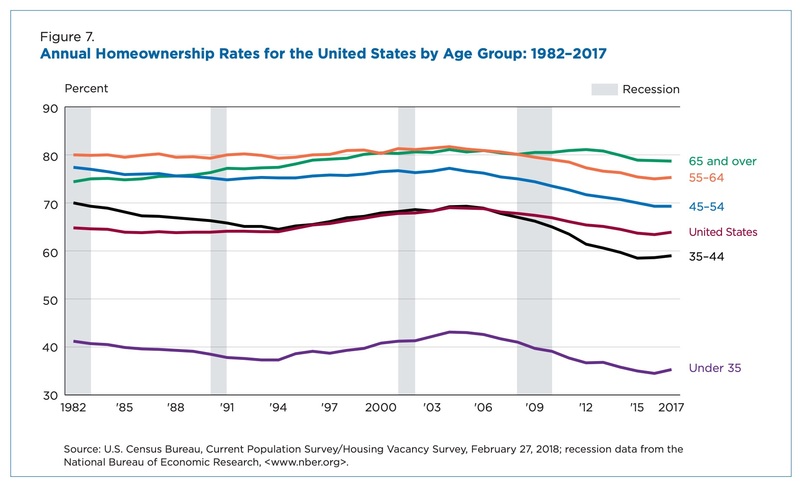 People who are 65 and older have the highest rate of homeownership. I know my math isn’t exact but it isn’t any better or worse than anyone else’s.